Fiber Sticks: [Whole Wheat Flour, Soy Grits (Made from Non-Genetically Engineered Soybeans and Corn. 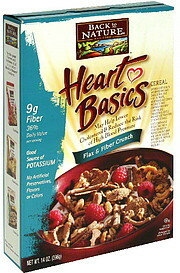 ), Evaporated Cane Juice, Red Wheat Bran, Yellow Corn Flour (Made from Non-Genetically Engineered Soybeans and Corn. ), Oat Bran, Salt], Fiber Flakes: [Whole Wheat Flour, Red Wheat Bran, Soy Grits (Made from Non-Genetically Engineered Soybeans and Corn. ), Evaporated Cane Juice, Oat Bran, Salt], Flax and Fiber Granola: [Evaporated Cane Juice, Wheat, Flaxseed, Whole Grain Rolled Oats, Yellow Corn Meal (Made from Non-Genetically Engineered Soybeans and Corn. ), White Rice Flour, Organic Expeller Pressed Soybean Oil (Made from Non-Genetically Engineered Soybeans and Corn. ), Barley Malt Extract, Salt, Soy Lecithin), Vitamin E (A Natural Vitamin to Help Preserve Flavor). Vitamins and Minerals: Calcium Carbonate, Sodium Ascorbate (Vitamin C), Zinc Oxide, Vitamin B6, Reduced Iron, Niacin, Folic Acid, Thiamin Mononitrate (Vitamin B1), Vitamin A Acetate, Riboflavin (Vitamin B2), Vitamin B12.